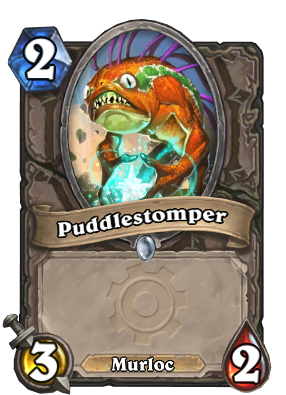 The flavor text of Puddlestomper references the new Shaman hero, Morgl the Oracle. Ben Brode stated they've been "excited about Morgl since way back ;)"
This mention about Morgl's existence was more than 1 year ago, wasn't it? i can't believe this didn't exist already. nice artwork. You mean if you'll need a copy to get Old Murk-Eye? You'd definitely want two of this card in any murloc deck anyway, so I don't think it'd be a big deal if it becomes a requirement.